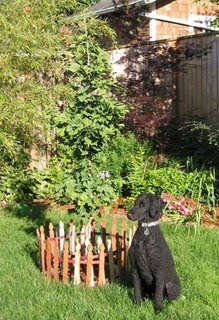 "This particular tree traveled 2000 miles in a small flowerpot, 5 years ago, from Chicago to Vancouver, Washington. It was planted in its present location in 2003, where it has flourished. The dogs use the area around it as their special 'bioremediation' area, so it may be overnourished, but it hasnt seemed to mind, and is reaching a size where it should become more resilient to the world's insults." * Added more fossil photos from David Scarboro's collection: Tertiary (Paskapoo and Unterwohlbach Formation), Cretaceous (Baikal Formation), Triassic (Tasmania and Dinmore Quarry). Thanks David! Three quilts of beautiful Japanese ladies have been created using a new range of fabrics by Lonni Rossi called Ginkgo Fantasy. Read more here. * Update info of the Ginkgo at Kew: Royal Botanic Gardens, UK. * Added photos Ginkgo in Mar del Plata, Argentina and Pontoise, France. * Added new cultivars on my Tree-page ('Globosa, 'Beijing gold' and female 'Fastigiata') with photos. * Added photos Ginkgos in Oxford, UK and Madrid, Spain. * New photo photospecial page: Street with Ginkgo trees in Dresden, Germany. Hola, Mi nombre es Stella Pusino. Vivo en Montevideo (Uruguay) y entre otras cuestiones me dedico a la cría del árbol. Quiero tener una plantación de ginkgos. Estoy tratando de contactar a quien pueda orientarme en los primeros pasos. "With ginkgoes gracing the south entrances to Alden Library, it is fitting that the ginkgo leaf, a symbol of long life and memory, also be a symbol of the Friends and of the Libraries, as they supposed the preservation of the past and the formation of ideas for the future." This text can be found on the website of Ohio University's Libraries. * Added new recognition by 'Species - Research Conservation Management': Awards-page. Preheat the oven to 350 degrees. Cut the base off of the mushrooms and separate them (or if desired, keep them in little clumps). Heat a skillet over a moderate heat and add the garlic to the olive oil to flavor. Remove the garlic when it turns golden. Increase the heat and quickly saute the mushrooms and ginkgo nuts; season with the salt. 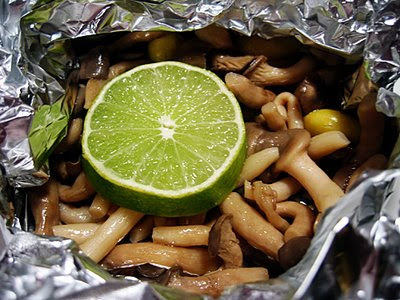 Divide the mushrooms into four equal portions and transfer each portion into the center of an aluminum foil sheet. Add a lime slice to each one and gather up the corners to make parcels. Make the parcels as roomy as possible so as not to crowd the ingredients. Put them on a baking sheet and bake them for 5 minutes. Serve unopened and let your guests enjoy the fragrance as they open them at the table.